Rich Donovan is founder and CEO of Fifth Quadrant Analytics (FQA) in New York City, a company that helps businesses assess how well they’re engaging people with disabilities as employees and customers. With 1.1 billion people globally, the disability market is the largest minority market, Rich says, but one typically ignored. FQA has developed a Return on Disability Rating that measures how well a business is performing—in recruiting disability talent, building its disability customer base, and mining business innovation from the adaptation that disability prompts. In 2006 Rich founded LIME Connect to match the brightest people with disabilities at top universities with employers. Rich (above with son Maverick, 2 1/2) has cerebral palsy. Meet Rich March 27 at a BLOOM speaker night. BLOOM: Before starting FQA, you were a very successful trader for Merrill Lynch. I spent my university summers working in brokerages here and it didn’t strike me as a place where people with differences would be welcomed. What was your experience? Rich Donovan: The opposite. I found in that business that it doesn’t matter who you are or what you are, whether you’re purple, blue or polka dot, if you can provide results, you’ll be very successful. Initially you may have a higher hurdle to jump over, but once you’ve proven your value, your worth, there’s no better business for someone who is 'different.' I was on the trading floor and nobody cared what you looked like as long as you got the job done and got the results in the door. For me that was the perfect environment because I delivered, every year, consistently, day in and day out. BLOOM: How has having a disability influenced your work? Rich Donovan: If I wasn’t disabled, I’d probably be either a fighter pilot or some kind of guy working with machines because that’s always intrigued me. Because I have a disability, I have to do things a bit differently. It’s caused me to develop strategies for dealing with a world that’s not built for me. In the worlds of business and finance, that’s what everyone is looking for: that unique point of view in the world that nobody else has, that nobody else can develop. The great thing about disability is that it’s inside us. We have to [adapt] day in and day out to survive, and when you start to apply those skills to business and financial problems, and to things that people come in looking at in the same way in general, it gives me a huge advantage. Working for me is easy. Try navigating the New York subway system. In a day that involves getting to and from the office, dealing with complex financial issues is the easiest part of my day. That turned my perspective completely upside down. For most traders the hardest thing is to remove emotion from the calculus. For me, trading wasn’t the most risky think I did every day. That changed the perspective of how I look at business problems. BLOOM: LIME recruits high-achievers with disabilities from the best universities and matches them with employers. How could we broaden this to bring people with a variety of intellectual and physical disabilities, who don’t have degrees, into the workforce? Rich Donovan: That’s a very complex question, how you bring this class of skills levels right up and down. LIME recruits mostly on campuses but also experienced hires as well. The focus is from the corporate perspective, on what corporations need in terms of talent as opposed to the typical vocational rehab model where you take a square peg and find any whole it can fit into and it typically fails. There’s a mismatch. Companies that are just getting their feet wet want to do something to get someone in the door. When that person doesn’t match a job, they’re turned off and don’t want to touch it again. The way LIME addresses this is very simple: It takes people with disabilities who already have the talent the company wants. About 90 per cent of the people LIME sees on campus have learning disabilities—things like dyslexia. Because I’m the founder, people assume that most of our recruits have physical disabilities. But they mostly have learning disabilities because that’s where the numbers are. A big issue I have with how the United Nations and governments work with disability is that they’re overwhelmingly branded toward physical incentives, when less than 10 per cent of the people with disabilities use a wheelchair or have mobility problems, less than 3 per cent have vision issues, and less than 3 per cent have hearing issues. But that’s what dominates the discussion of disability. The reality is that 71 per cent of disability is invisible. It’s a learning disability, it’s chronic pain, it’s something you wouldn’t know seeing someone walking down the street. Because organizations that focus on physical disability have been around for the last 40 to 50 years, the brand of disability is the wheelchair, or the white cane. But that doesn’t reflect the numbers. To fit a market into a business context, we make a conscious effort to ignore that—to stay condition-blind and focus only on what matters to consumers with disabilities and to potential employers. I frankly don’t care what medical diagnosis you have. I care more about how it affects your behaviour as a customer and as a potential employee of a company. That’s the difference in what we do. BLOOM: You’ve said the disability market is the biggest minority market in the world, if you include people with disabilities and their close relatives. Why doesn’t it feel like we have any power? Rich Donovan: If you look back from the 1950s to the 1990s, disability groups have painted a picture of disability that was so pathetic, and so 'God help you' and 'I need you to help me to keep these kids safe.' That creates a brand in society that these guys need help, they’re charity, there’s nothing of value there. But when you look at the actual statistics today, when society has dramatically changed, the numbers don’t bear that out. People with disabilities globally, not counting friends and family, are 1.1 billion people, which is the size of China. ‘Yea, but they have no money,’ people say. Well, that’s part of it. We know that the average income is lower among people with disabilities. But it’s still 75 per cent of the typical person. That’s serious earning power. If you look at the bell curve and look at a normally distributed population you begin to realize that income level is brought down by the lower functioning boats. But if you look at the average consumer with a disability, they may make $5,000 to $7,000 less a year, but that’s still almost $30,000 a year. The pushback I get from charities is that ‘these people are poor’ and they’re not. Yes, there is a segment of this population that is poor, and there’s a segment of every population that is poor. But it’s not unique to disability. The reason no one has heard of these folks as consumers and savers is because there’s a vested interest in charities keeping the view that they’re poor. The perception is that all people with disabilities are poor. I would say statistically a higher percentage of people with disabilities are below the poverty level than the typical population, maybe 20 to 25 per cent. But that still leaves the vast majority of folks who are active consumers. And even people below the poverty level are active consumers. As we evolve from the social mindset of ‘take care of me’ to ‘hey, these people are consumers with demand’ that’s when change will happen. That’s why you haven’t heard of this before. Attitudes have changed and education has changed. Guys like me didn’t exist 30 years ago because we wouldn’t have got the education we needed. People say ‘You’re one in a million Rich,’ but I’m not. There are millions and millions of people like me. BLOOM: You mentioned Walgreens—the largest drugstore chain in the U.S.—is a leader in employing people with disabilities. What have they done? Rich Donovan: It started 10 years ago when the senior vice-president of their distribution business—who happened to have a child with Down syndrome and who’s a smart business guy—realized 'Gee, what’s going to happen to my kid when they leave school? I need to figure out how he or she will be a productive member of society.’ He started thinking about how he could integrate people with disabilities into his business. It started out as an altruistic approach to hiring people with disabilities. He began in one distribution centre in South Carolina. He hired about 10 to 12 people with disabilities to take product in from the vendors and ship it out to their stores. All kinds of machinery and processes are involved. Over the next year they realized something unique. They started to see that their costs were going down. They couldn’t figure out why. Then they realized that people with disabilities did things a bit differently on the floor. They saw that they took complexity out of the process. Adapting the workspace for these people with needs and accommodations reduced complexity. So let’s say instead of typing something in repetitively, a process becomes colour-coded or symbol-based. These employees changed the way they were interacting with the environment and reduced costs by 20 per cent. Every step has a cost and every time they make a mistake there’s a cost. The average cost of a distribution centre is $10 million a year to run. So Walgreens was putting $2 million in their pockets every year. BLOOM: Are staff with disabilities paid at market rate there? Rich Donovan: I hope they pay them more for saving them money. There’s no wage subsidy at Walgreens. Wage subsidies disgust me. I’m disgusted by the fact that the only people you can pay below minimum wage are people with disabilities. Walgreens has developed a model with its own training programs and job coaching and will take those learnings to other sites and centres. BLOOM: I read that over 40 per cent of the 700 staff in Walgreens’ South Carolina distribution centre have intellectual or physical disabilities? Rich Donovan: I think what they’ve done is spectacular. People in this field still think of it as a recruiting effort, but it’s actually far more powerful than that. It’s changing business process. People with disabilities have had to learn ways of adapting. If you expand that across the entire economy and the way every business does things, think about what that 20 per cent number looks like. How powerful it is. 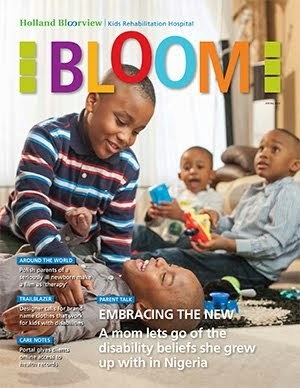 BLOOM: I think what Walgreens has done is amazing. But I wonder if in some ways it doesn’t still pigeon-hole people with disabilities as only able to work in assembly-type jobs? When my son was at a segregated school, they had him putting flashlights together—I guess in anticipation of him doing piece-meal work in the future. What if my kid isn’t interested in that? Rich Donovan: When it comes to disability, one of the things we’re poor at is seeing the trees and not the forest. Walgreens is the first out of the gate and it’s going to take years for other businesses to realize what they’ve done and start to get comfortable with the concept. People start with one thing and then they realize ‘I can apply these insights here and here. I can move them into these other environments.’ The smart people start to realize that there’s real value in these insights. There’s so much value, so much profit to be made here, that smart people who want to make money are going to jump all over this. All that will happen, but it’s a question of how long will it take? I think it will probably be three to five years. BLOOM: What is the purpose of your company 5th Quadrant? Rich Donovan: To put rigour and process and numbers around how you make money relative to disability. How does a company take this amorphous concept of a person with disability and put it to work for their shareholders? How do they build value from disability? That's how every other minority market has developed over the decades. Now, I don't want it to take 70 years, like it did for women. I don't want it to take 30 years, like it did for racial minorities. We've learned lessons there that can be applied here. We’re basically giving every company that we analyze a score—from zero to five—five being good, zero being not so good. We assign each company a rating. BLOOM: How can companies improve on their rating? Rich Donovan: For each company the approach will be different because each company creates value for its shareholders in different ways. For some, talent tops the list. How do you get people with disabilities in the door and get the most out of them and keep them there? For firms where process and innovation is key, we'll look deeply at productivity. You take the Walgreens model, where you take innovation from disability and apply it across your business model. For me, how firms look at their customer is absolutely critical. Astonishingly, this is probably the least commonly addressed factor today. Among the questions we ask—how do you leverage disability to maximize revenue from your customer base? And that includes not just people with disabilities but their friends and family, who are probably more numerous and more wealthy than the people with disability. As a parent, you know how you react when you see a company reaching out to disability. It bonds you to that brand. We’ve studied this, we’ve studied what this bond looks like. No one has really looked yet at what do people with disabilities actually want as a customer? What do they desire? There are examples here and there. This in my mind is the biggest opportunity for business: to start activating on the customers. Fantastic! I am going to share this with the folks at Social Innovation Generation, PLAN, and the UK Employers' Forum on Disability. Thank you, Louise!